Since the Rota Tip is robust, it is ideal for heavy-duty use. It tips the box upside down so that it is completely emptied and no product is left in the box. The Rota Tip handles the product with great care and its high capacity makes it ideal for food processing lines with a continuous supply of products. 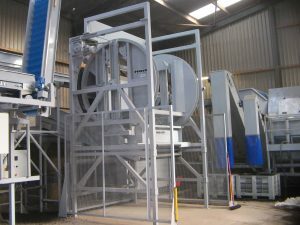 The box tipper has a rubber-clad storage container below the tipping unit with a wide removal conveyor, which has a variable speed.